The trouble with marketing (so far as I’m concerned, anyway) is that I can’t do it. I put this down to a fault in my marketing DNA, or ineffective potty training. The former is a hereditary trend that I can confirm because my dad had a pHd in hair-cutting and could only ever get five bob max., for a full-Monte haircut, and blow-dry. Or something. I know that most marketing folks are a lot closer to their potties (might still be on ‘em for all I know) than I’ve been for a long time; but a cast-iron potty leaves its salutary mark. Even from those earliest moments, we were encouraged to advertise our gifts and expertise by placing them under tarps after burial at sea. Consequently, I couldn’t sell a bucket of water to a burning Eskimo. Even allowing for that immense handicap, there is another that one must surmount before effectively surviving a ‘Marketing Strategy’. I’m not sure where that came from. Probably a weak moment while reading ’1984′. The readership of this arbiter of poor taste, which by now must number well into single figures (and I know who they all are), are all by this time straining to get some inside information on this ‘other handicap’. I call it “sense and reason” and although it’s as rare an earth element as ‘Blowfeld-a-mite’ it will torpedo any marketing dingy and sink it deeper than the Atlantic Trench. I suffer from this defect a lot, which is why I have trouble with electricity bills and the like. There might be reasons for the bills, but I can never make any sense of them. Which gets me to the reason for this blog. It’s my ‘Marketing Strategy’. I have, at this very moment seen a huge flaw in my ‘Marketing Strategy’. So far as I know, robots rarely carry small change in their pockets, and as the visitors to this blog seem to be outnumbered to the power of some fabulous number, by robots, my little book sale idea seems destined for the slag heap. Draining board. Flush pile. Whatever. So, in the unlikely event that you might want to waste a quid (dollar/euro/thing) on actually buying the sort of garbage you have just managed not to avoid, here is a link to Amazon Kindle. This, I’ve just found, doesn’t work, which immediately starts a series of convoluted thought processes mostly dedicated to some sort of victimisation syndrome. The first being ‘Amazon Doesn’t Want Me!’ Let’s face it, my ‘marketing strategy’ is clearly as accessible as a distant mirage; a tortoise surrounded by cliffs of the Eiger within a minefield of razorwire. Not, then, overly inviting. Never mind; somebody might accidentally fall over it while researching ‘Dentistry for Bricklayers’. We shall see. The book is called ‘Star Truck. 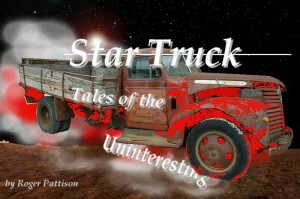 Tales of the Uninteresting.’ and it’s a collection of ten science fiction stories. It’s got a BONUS TRACK as well. So if you didn’t like the first ten you get another to make you even more irritable. And that’s my best shot at a hard sell. No pics in this. Sorry, but it’s just a quicky. It was something I’ve come across before about the JCM 2000 and forgot about it. It’s an age thing, I think. Like forgetting which side of the saucer to sip your tea from. The amp has three pins sticking out from the back, to enable bias checking and adjustment, the adjustment being done with two preset pots either side of the pins. There is a problem with this arrangement, and if you don’t know about it, it could cost money. In the worst case, it could cost you a lot of money. The idea is that you can check the voltages at the pins and adjust the output bias. The pins directly connect to the cathodes of the output valves, and you read the voltage across a small value resistor, thus checking the standing current through the valves. In your friendly user manual it will no doubt give you the value of the ‘correct’ reading, which I think is 100 mv (milivolts) if memory serves. One of the preset pots gives the bias on one pair of valves and vice-versa. The one that came to me had been badly adjusted and caused the right side pair to have significantly overheated. You can tell this easily, as the painted- on marking on the glass discolours. In a worst case, the anode (the grey box inside) carries discolouration usually towards the vertical seam of the valve. One other point. The 100 mv reading is no better than a rough setting. The one I had, I set at 91mv (having set it up on the oscilloscope) so at 100 mv your valves would have been working harder (and therefore wearing out faster) at no signal condition. This also puts a strain on the output transformer; and if you really get it wrong, can fry the transformer. Hence the ‘very expensive’ mentioned earlier. Biasing is definitely safer left to an engineer. Time for tea. Not so much a Triumph, more a minor disaster. But not (entirely) my fault. I like amps that throw up all sorts things you didn’t expect. You might say the same of last night’s vindaloo, I suppose. This is another mystery of the universe. Why this, the third’60′s Selmer in as many weeks after not seeing any for a decade (ish) has turned up, must be an invocation from Gruftro, the great god of Selmer amps. Sorry, got a bit carried away. So, what’s so oil-fired (note the clever alliteration there) interesting about this amp? Here it is. At first sight, this is exactly the same as every other spring line reverb unit in a lot of combo amps. There are some springs. Technical eh? But then we have the word ‘transducer’ that rears it’s ugly head. And that’s the first bit of interest. 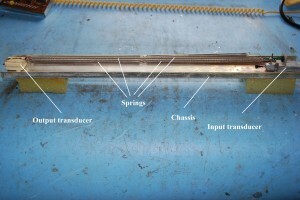 What is a transducer. Here’s a few examples of a transducer. Guitar pick ups are transducers. Taken as a generality, any piece of electronics that converts some form of energy (motion, vibration, light, heat, etc.) into an electrical current/voltage (or vice-versa) is a transducer. On this pic of the Selmer spring reverb there are two transducers, an input and an output. One of them, (the input transducer) has a signal applied to it from the amp; effectively your guitar sound, or whatever. This voltage sets a stylus in motion, very like a speaker vibration. This sets the spring in motion, and this motion is picked up by the transducer at the other end. Anybody who has twanged a spring, (some folks ride jet skis, I twang springs; sad eh?) knows that the sound carries on for some time, and this is the delay that happens betwen the input transducer shaking the spring around, and the output transducer picking it up and sending it back into the amp, where it is mixed in with the original signal. So that’s pretty much how they all work. But this one is a bit different and it introduces the subject of impedance. On a spring reverb unit today, and for a long time past, for that matter, the transducers are small coils of wire, and they have a low impedance. We can, for now, think of impedance as a kind of resistance, though really, it is more complex than that. There’s a formula that’s crept into the diagram, which is a worrying development. But we can cut out all the stress that might cause. By ignoring it. Well, most scientific endeavours survive on the premise ‘ignore the bits that don’t fit and they’ll go away’. That’s how we got to the H bomb. This is not as dangerous as an H bomb. Probably. I’m sure you’re surprised that we seem to have tangentially swung off topic by a distance of the orbit of Pluto. I keep away from dogs as much as possible, anyway. Let’s face it, it does seem a fair excursion from a Selmer reverb to an H bomb. Making a hurried return to Earth and insanity, then. Visualisation is easier than numbers. That’s bit sweeping. Like saying ‘all bats are vampires’. But let’s try it. Humour me. A ladder is propped up to a wall. If the voltage at the top of the ladder is say 10volts, then if I walk halfway up I’m at 5 volts. That’s how it works. If r1 and r2 were propped up against a wall, and r1 was the same as r2 (in yards, feet ,centimeters, ohms, or whatever) and I stood at the point where those two thngs connect, then I would be halfway up. Clearly, if r2 gets smaller, then I get closer to the ground, until there gets to a point where I’m standing on the ground, wondering why I put a ladder up. That’s why this network is called a ‘voltage divider’ (potential divider, more correctly), because it divides whatever it is you put in, by a ratio depending on the values of r1 and r2. Back to the plot, when I remember what it was. A modern(ish) spring reverb uses coils to input and output the signal to the spring. A coil is merely a piece of wire, coiled up(! ), it is a low impedance device. In this old Selmer reverb, the transducers are actually cartridges of the sort that used to be used in record players. Most modern cartridges are magnetic but the earliest ones were ceramic or crystal cartridges. A crystal has a property which means it is a natural transducer. If you apply a voltage to it, it will produce a vibration, and if you squash it you produce a voltage. The unfortunate part about this is that a crystal has a very high impedance, exactly the opposite to a coil, then. So what? This reverb unit had a faulty output cartridge (it didn’t work), and a reverb unit with these transducers doesn’t exist anymore. So, just put a modern one in then! No, it won’t work. Why not? Wait for it, we’ve got to the point. The drive to the unit comes straight from a valve. A valve output is very high impedance (usually), so if I supply a modern reverb unit from this valve drive its like our ladder being a mile high and I’m standing on the bottom rung; next to nothing gets to the transducer. It just won’t work. So, sadly, this was an unfixable fault. Don’t get them very often, thankfully. Time for tea. p.s. I probably lied when I said it was not fixable. I’ve found since that Accutronics/Beltron are doing reverb tanks on a build to order basis, and have a choice of impendances, the highest being around ten times the impedance of the standard tanks. That might just hack it. But as it is likely to be an expensive fix, I didn’t get to try it out. Hence the ‘probably lied’. Worth remembering though.